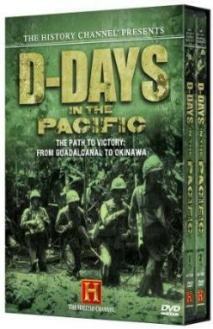 The first DVD of this two-DVD set includes three documentaries that make up the series entitled D-Days in the Pacific, a chronological account of several of the some 75 major U.S. amphibious landings in the Pacific during World War II, including Guadalcanal, Attu in Alaska, Tarawa, Saipan, Peleliu, Philippines, Iwo Jima, and Okinawa. A D-Day is when the actual attack of any military operation will begin, so each separate landing during the Pacific War was technically a D-Day, which means based on this definition that there were over 100 D-Days that were executed by the U.S. military against Japan during the Pacific War. The second DVD has three documentaries, one on the bloody battle to take the island of Peleliu, much of which gets used in the first DVD's segment on the Battle of Peleliu, and biographies of Admiral Chester Nimitz and General Douglas MacArthur, leaders of America's advance across the Pacific toward Japan. The episodes in D-Days in the Pacific provide a good mix of comments by veterans who fought in the battles covered and Pacific War historians. The shows focus on the American side of these D-Days with no interviews of Japanese veterans or historians and with only brief coverage of Japan's military strategies. The narrator emphasizes that the Pacific War D-Days need to be recognized alongside the great D-Day in Normandy, France, where 3,000 Allied soldiers died. Over 20,000 American soldiers, sailors, and marines died during Pacific D-Days as they faced Japanese soldiers who fought to the death in order to defend the islands that they occupied. "The Final Graveyard" episode covers D-Days at the Philippines, Iwo Jima, and Okinawa. This episode has a segment of about ten minutes entitled "Kamikaze," which includes four minutes on aerial kamikaze attacks against the American invasion force around Okinawa and the suicide mission of the battleship Yamato toward Okinawa on April 6-7, 1945. The narrator starts the segment by incorrectly stating that Japan's first mass kamikaze attack took place on D-Day plus 6, which would be April 7, rather than April 6 when it actually occurred. However, later in the segment the narrator accurately says that it took place on D-Day plus 5. The narrator states that the Japanese sacrificed 1,465 pilots and planes between April 6 and June 22, 1945. This is inaccurate, since the figure does not relate to pilots but rather planes that flew suicide missions from Kyushu in the ten mass kamikaze attacks during the Battle of Okinawa (according the U.S. Strategic Bombing Survey). In addition, there were 185 planes that participated in sporadic small-scale suicide attacks, and 250 kamikaze planes that flew from Taiwan, so in total 1,900 planes are estimated by U.S. authorities to have flown suicide missions during the Battle of Okinawa . The episode includes comments from an officer who during the Battle of Okinawa was on the battleship Missouri, which was hit by a kamikaze aircraft on April 11, but had little damage and no deaths due to the ship's thick armor. Rielly, Robin L. 2008. Kamikazes, Corsairs, and Picket Ships: Okinawa, 1945. Philadelphia: Casemate.